That is a gem. Thanks for sharing that one–never seen it before anywhere. 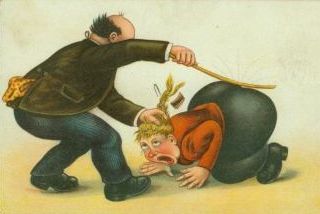 Perhaps you could do a future post on this vintage spanking postcard genre? PS – if you want to post it, (you took the link off of your email, so I can’t email you through that) – I have what I consider the perfect picture of disobeying the boss. Its my boyfriend and I laying down on a bed – and the paddle is in his hand, but the string is wrapped around my wrist – preventing him from really using it. I know you post random pics sometimes, and as I read a lot of your stuff, it would be nice to give back. You don’t need a facebook account to use it.